Allamanda is not a typical houseplant—it's a decidedly tropical plant that needs significant warmth and moisture to thrive during the summers. Also, it's a loose climber that benefits from support (although it can be grown as a small shrub). Lastly, although there are varieties that have been treated to remain small, natural allamanda plants tend to be fairly large. In their natural environment, they grow to largish shrubs. Despite all these downsides, there is one excellent reason to grow allamanda indoors: their flowers. These plants, especially the A. cathartica, feature large buttery yellow flowers with a brown throat and intoxicating fragrance hidden among large, glossy leaves. When the plant is in full bloom, it is likely to be covered with these 3" or 4" flowers and will be the pride of your collection. Light: Allamanda prefers strong light, including some direct sun. They can be trained to full sun, or they can be grown successfully in an east-facing window with a few hours of morning sun. Adequate sunlight is essential for blooming. Water: Water liberally throughout the summer, making sure your growing pot has good drainage. It's also helpful to mist every other day or so to provide adequate humidity. In the winter months, reduce watering, but don't let the plant dry out and make an effort to keep the root ball warm. Allamanda roots readily from stem tip cuttings. To have the best chance of success, take the cutting early in the growing season from a fresh green shoot. Use a rooting hormone for best chances of success and pot the cutting into a fresh pot of seed-starting soil. Place the cutting in a warm, humid environment with bottom heating and wait for new growth to emerge before potting out into a larger container. Repot allamanda in the spring, when new growth emerges‚ this is also a good time to take cuttings. When you repot, place into a larger pot and provide some support if necessary. Allamanda can be grown as a low shrub, but it does best (in my opinion) if allowed to grow up a simple support and trail slightly. This seems to show off its blooms to maximum effect. There are more than a dozen species of Allamanda, but the most common one in cultivation is the A. cathartica. This plant is sometimes called the golden trumpet and is a common landscape plant in subtropical and tropical regions. Within this species, the grandiflora variety features large yellow flowers, while the hendersonii features slightly smaller redbuds and golden colored flowers. Allamanda is not a very forgiving plant in the home environment. Plants that are exposed to cold drafts or denied adequate water tend to drop leaves with impunity. Also, they will not bloom unless there is adequate warmth. For these reasons, many people in colder latitudes reserve Allamanda for the greenhouse or conservatory, which makes sense. 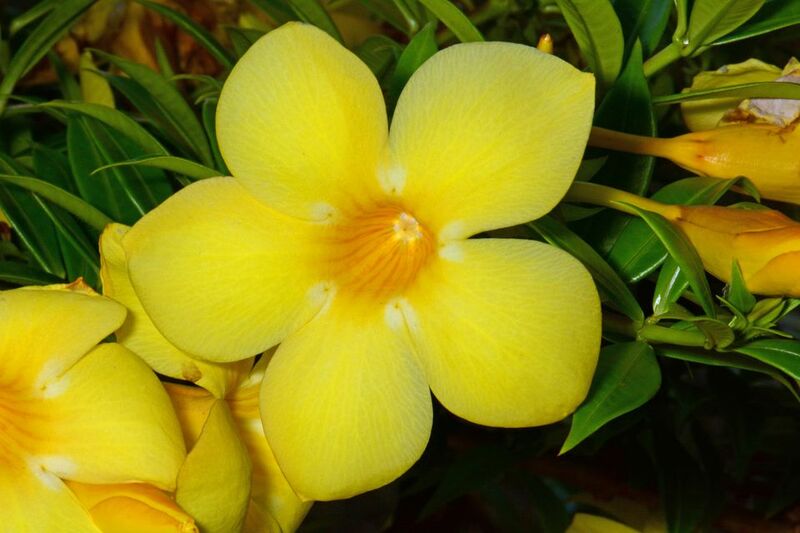 The most dangerous period for Allamanda cultivation is winter when even warm houses tend to become exceedingly dry. In these cases, it's essential to mist your Allamanda frequently to help it keep its leaves—dropping leaves is not a good sign or a sign of natural growth cycles. Lastly, Allamanda is somewhat vulnerable to pests, especially aphids and mealybugs. Keep your eyes peeled for signs of infestation and treat at the first indication. Can I Grow Flowering Maple Inside?